With the new year well on its way, I’m thinking about what’s in store for myself in 2019: what things I want to associate with, what work I’ll do, what activities I’ll plan, how I’ll be creative. So much to think about, a bit overwhelming. But I’m going to go with the FLOW, which is my word for this year. At the heart of that flow will be curiosity. I am becoming more and more curious, about everything really. It’s as if I’ve been born again and this big wide world is all so new and I’m discovering it for the first time. And it’s exciting. I’m intrigued. I hope to go with the flow, take it all in, learning and growing in this new fervent curiosity, and wanting to understand everything on a deeper, more meaningful level. So I’m going to become curious, even more curiously creative than I’ve been in past years. To see what’s fun and electric, discovering what really brings me joy. Bringing me to that point in my creativity where I get lost, when I’m in that creative zen. And because I’ve labeled myself a Creative Dabbler, I’m going to be curious about everything. If there’s something I’m interested in or something I want to try I’ve never done, I’m going to do it! This is the time. Test, try, be curious. Why not? I’m going to keep asking myself all kinds of questions about creativity, diving deep to the heart of why, what, where, when, and how. I’m eager to know and learn thing, the very definition of curious. For starters, I’m going to sign up for more creative classes, both online and in person here in Seattle. I’ll sign up for creative workshops, as well as “in the mail subscription boxes” full of creative projects to try out. 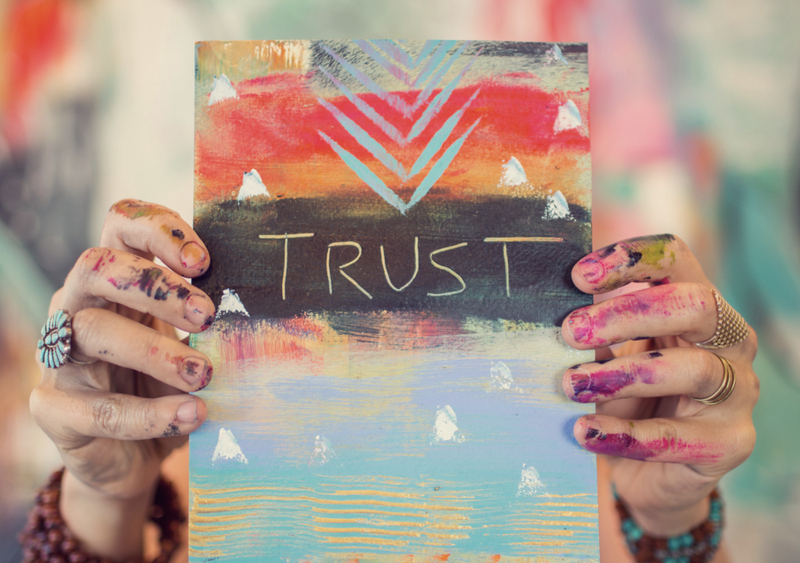 I’ve just signed up for Flora Bowley’s Bloom True workshop and I can’t wait for summer to come. I’m mesmerized by Flora’s free form painting methods and I want to see what unfolds as I intuitively paint. There’s still a couple spots left… join me! This week I also signed up for Let’s Make Art monthly subscriptions and I’m dying for the first one to arrive on my doorstep! I’ve been wanting to improve my watercoloring. It’s an art form that is very freeing, very FLOW. And it ties in so well to my word for the year – FLOW. I’ll also be taking a class on Nuno Felting. A friend of mine introduced me to this fascinating technique I hadn’t ever her of before. I hope to make a Nuno scarf very soon and I’ll show it off here in this new series all about being Curiously Creative! Embroider onto old timey photos, bringing in more personalized art. Learn the art of mixed media. I just don’t have the eye for how to make this type of art happen and I’d love to learn. Happily I have a very talented friend I can go do. I’ll share more on this process for sure. Write a song and play it on my guitar – eek, this makes me a bit scared, I’m not the best singer, but I hope to show off my writing and guitar playing. Maybe take an improv class!!! This one is so scary too, but I’ve always wondered if I could do it! We’ll see. Paint like Bob Ross – either watch a show and have my station set up just like him or find a place where they teach these classes! Flower arranging! This one I’ll be very proactive about doing this year. I always buy a set of flowers, usually arranged by the store, but by the time I get them home and add them to water, they never look good. They are always so haphazardly placed and I’d love really enjoy the flowers I put in my house to make me happy. What are you curious about with creativity? Is there something you’ve been wanting to try out? What are your creative goals for 2019? The post Becoming More Curiously Creative appeared first on Make and Takes. March 1, 2016 at 7:55 AM Are You Killing Your Employees’ Creativity? February 25, 2016 at 3:30 AM Are You Killing Your Employees’ Creativity?